I used Mac OSX to run the analysis along with a computer cluster. If you don’t have access to a computer cluster, a desktop will work if it has sufficient enough RAM (it’s just a lot slower). Hit ctrl + x to exit and Y to save the script. Next type chmod 700 fastgun into the command line. Execute the script by typing ./fastgun into the command line. This should gunzip all the files. The output should include an html file that contains your report. Based off this report you can decide what you would like to trim from your data. Install trimmomatic(version 0.36) the same way you installed fastqc, type: brew install trimmomatic. In order to execute trimmomatic you must enter the folder that trimmomatic is installed in making sure it contains the jarfile ending in .jar. Below is a sample command to trim the first 5 bases. Upload this to the cluster using cyberduck. Upload all your fastq files as well. To access the cluster type ssh <cnetID>@midway.rcc.uchicago.edu into the terminal. You will be promted for your password. Change directories to the grove account by using cd /project/egrove. To exit the cluster simple type exit into the terminal. 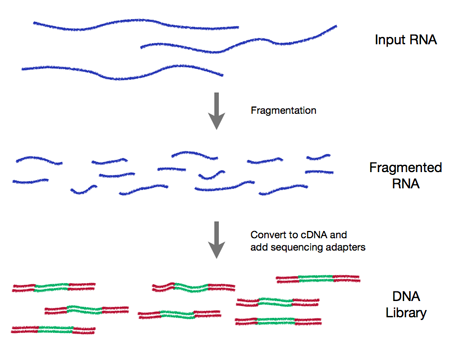 Decompress the genome using the cluster by the following script. To create a script, follow the same process as above using the nano command. To submit your job to the cluster type sbatch <name of script>. To check the status of a job type squeue –job <jobID#>. Move all the generated .bt2 files to where the genome.fa file is located using the mv command. Do this for each fastq file that you have. After the alignment is completed go into your directory and change the names of accepted_hits.bam file to the name of your sample. You should find this in the directories you made. This should give you a bam file and a .bam.bai file. Download these using cyberduck to a folder on your local computer. You can now use these files to view the alignment in IGV (integrated genomics viewer). The next step is to create a count table of FPKM values to give to the R package edgeR. Download the annotation .gtf file from the cluster to your computer. Go to http://subread.sourceforge.net/ to download the featureCounts program. Installation instructions are on the website. Once installed go into the subreads folder under bin. You can open the .txt file in excel to see the output. The following count data was imported into RStudio and using the edgeR package was fitted to a quasi-likelihood (QL) negative binomial generalized log-linear model to calculated dispersions with the glmQLFit() option. Goodness of fit was determined by a QL- F-Test using glmQLFTest() function. Differentially expressed genes were obtained using the benjamini-hochberg p-adjusted method with a p value cut off at 0.05. A list of your differentially expressed genes can be found in the file: RNAseq_edgeR_analysisWithFittedValues.txt. With this you can begin your analysis of GO pathways and clustering.